Sharon A. Jones, who retired as chief of staff for New Mexico State University System Chancellor Garrey Carruthers in July 2017, was recognized for her commitment to NMSU with an honorary degree in management during the fall 2017 commencement ceremony. 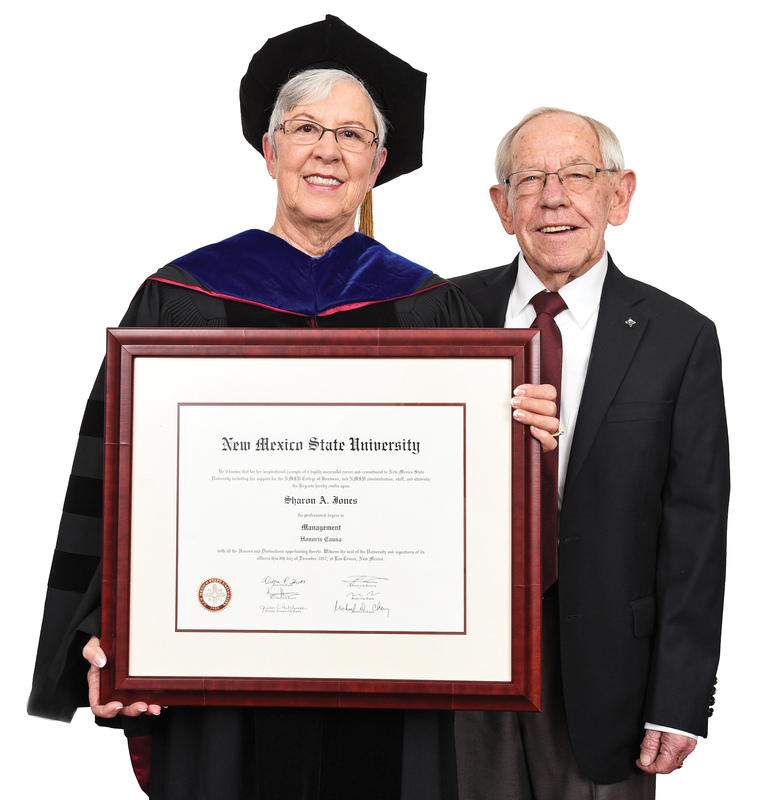 “Sharon’s honorary degree recognizes contributions that go well beyond her service to our great university,” Carruthers says. Jones served as a senior administrator and eventually chief of staff from 2006 until her retirement. Jones graduated with honors from Farmington High School and later attended college in Colorado. Jones and her husband, Ronn, were partners in a Farmington, New Mexico, grocery store before becoming volunteers for candidates seeking public office. The Joneses met Carruthers while volunteering for the 1976 Presidential Campaign. In 1977, Jones became the district director for U.S. Sen. Harrison Schmitt before being asked by Carruthers, then Republican Party Chairman for New Mexico, to serve on the party’s executive committee. In 1985, she joined Carruthers’ gubernatorial campaign as the organizational chair during the primary election and then as the campaign manager during the general election. Carruthers won and became the 27th Governor of New Mexico, and Jones served as his executive assistant from 1987 to 1990. Jones worked in the private sector from 1991 until 2006, when she became special assistant for Carruthers, who was then the dean of the College of Business and vice president of economic development at NMSU.